Desperate English Housewife in Washington, chapter 629 3 years ago Desperate English Housewife in Washington, chapter 629. 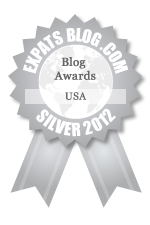 ExpatsBlog.com Expat Blog Awards 2012: USA Silver Award! This blog won the Silver Award for best expat blog in USA! What a witty writer! Hits the nail on the head with the differences between us UK peeps and the Yanks! Love it. So tongue in cheek, with a good dose of observational humour. Love it! I love reading this blog! Laugh out loud observations, thoughts and feelings on life across the pond. You can almost smell it, feel it and touch it yourself when you read it! Love this blog, always looking forward to the next instalment! The writer had me viewing Americans' habits and customs (myself) through different eyes. Upbeat, inquisitive and funny. Claire's blog brings her and the USA right into our sitting room and makes me even more excited about our planned visit. Love her observations and comments and especially the inclusion of Harry's perceptions of life in his new environment. Keep it up, Claire! Very much enjoying Claire's observations without the biased stereotyping. Witty and poignant. Keep up the great work Claire! I'm becoming addicted to this blog - it's funny, perceptive and has a sharp eye for the little things that make life for an ex-pat in the US so different from that at home. I like the perspective, healthily respectful but not all-embracing of American culture. Its funny and sometimes poetic. Good luck. I love this blog! Observations on America and the American way of life by a witty and perceptive writer. It makes me want to visit the States for myself. Keep writing! More than a travelogue, this blog is laugh out loud funny as the intrepid writer finds her way through the world of American customs and culture. Terrific piece of real journalism that brings to life the days of the family but within a quite different setting for them. This is amusing, articulate, accurate reporting which shows how differences can be funny, or just interesting, or even tiresome but difference certainly makes for good conversation. Love this blog! I'm becoming addicted to it and look forward to the next instalment. Such witty, laugh out loud observations. Keep up the good work! Just started reading this. Very interesting and amusing. Good luck. This is super fun to read. Always want to read more. I await the next installment of this blog every day / week! Well written and highly entertaining. Claire has the gift of observation and writing! Great blog, particularly while the USA is so much in the news in the uk. Good writing and a non newsy perspective. This is a great insight into USA life, reflecting on the funny side of life and the differences. I must-have read! Lovely well written blog, always informative and very funny. Really should be serialised on Radio 4.. Your blog Claire, is giving us a real insight into some of what life is in the 'big apple' it's a great read. Absolutely brilliant. Well written, insightful and humorous with a nice personal touch thrown in. Can't wait to read more. I love this blog - the writer has a real knack for observing the cultural differences and similarities between the UK and the US and never fails to amuse. Looking forward to reading more, especially with Thanksgiving and Christmas around the corner! So glad I stumbled across this blog! I am converted to your blog - always amusing to read about your adventures. Especially Hooters. You must do them all! This is one funny lady! She tickles my fancy and reminds me of ye merry olde england. This is a must read.